Florals for spring, how original. But hang on, florals have changed. They've been upgraded. 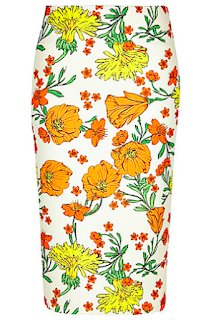 Florals are not just Easter Sunday or pretty cupcake prints anymore, oh no. They're oversized, unexpected colors, and nothing you'd expect. Today we're taking on florals in work-ready pencil skirts. See what I told you? Didn't see this one coming. So crisp and fresh for spring. 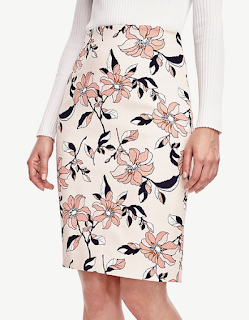 A little That 70s Show but pair it with a silk bow blouse and you're ready for 9-5. This skirt is going to hug your hips and slim your waist. Can't beat the price! This is something out of an adult coloring book and I love it. 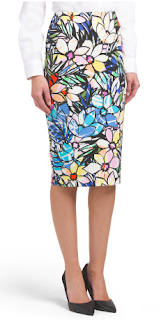 Don't pass on floral this spring. I promise you can find something that is going to work with tops that are already in your closet. Play with stripes or dots on top to really add a punch.